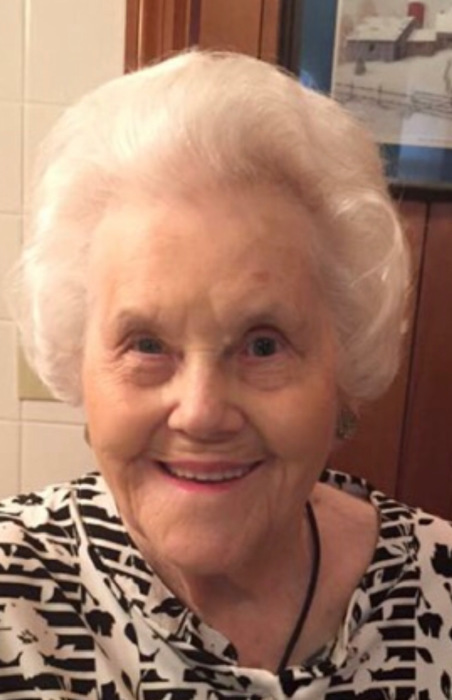 Wanda June Goff, 93, of Cromwell, Kentucky went to be with the Lord on Saturday, November 17, 2018 under the care of Hospice of Ohio County. She was born February 17, 1925 in McHenry, Kentucky to the late John Hoskins and Cordie Johnson Hoskins. Mrs. Goff retired from Cowden’s Sewing Factory and served many customers as a waitress at Sheffield’s Restaurant. She was a charter member of Cromwell United Methodist Church and Cromwell Fire Department and a founding member of Cromwell Ball Park. She was also a Kentucky Colonel. Mrs. Goff was not only loved by many but she gave an abundance of love to all. Aside from her parents she was preceded in death by her husband, Everett Goff; son, Rickie Glenn Goff; son-in-law, Russell McDaniel and siblings, Maurine Bratcher, J.C. Hoskins, Dorothy Wall, Kenneth Hoskins, and Fay McConnell. She leaves behind to treasure her memory two daughters, Pat (Warren) Skinnemoen of Winchester and Brenda McDaniel of Beaver Dam; daughter-in-law, Catheryn (Steve) Raymer of Cromwell; brother, Laymon (Nellie) Hoskins of Dayton, Ohio; seven grandchildren, Kris Ann (Greg) Creteau, Jonathan (Angie) McDaniel, Mike (Melissa) McDaniel, Jessica (Jared) Ford, Crystal (Tony) Drake; Ashley (Brian) Schaefer, and Lauren (Nate) Padgett and fourteen great-grandchildren, Ryan Creteau, Tyler (Whitney) Creteau, Zach and Cannon McDaniel, Ty, Makenzie, and Gunnar McDaniel, Carson and Parker Ford, Mya, Clara, and Henry Drake, and Jackson and Edison Schaefer. Funeral services will be held at 2:00 P.M. Wednesday, November 21, 2018 at William L. Danks Funeral Home in Beaver Dam, Kentucky. Burial will follow in Sunnyside Cemetery in Beaver Dam, Kentucky. Friends may visit with Mrs. Goff’s family from 5:00 P.M. until 8:00 P.M. Tuesday and after 9:00 A.M. until the time of the service Wednesday at the funeral home. The family requests expressions of sympathy take the form of contributions to, Cromwell United Methodist Church Building Fund, c/o Patsy Daugherty, 3806 State Route 505 South, Horse Branch, Kentucky 42349.